We now come to your home or office and repair your iPhone while you wait, usually in less than 30 minutes. No charge if you mention this AD. 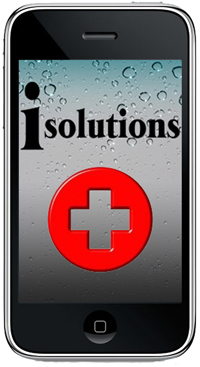 iSolutions can repair iphone 4, 3g, 3gs, xbox 360, and playstations. Call us now and ask about our 10 minute iphone glass replacement for under $70! ISOLUTIONS is incorporated in the state of Florida. Our founders not only repair i products but are also loyal users. They have been managing fortune 500 companies and servicing south Florida in the retail customer service industry for over 20 years. Less than half the cost of what Apple charges and professionally done in half the time. Our cost effective iPhone repairs give you piece of mind when you need to maintain, upgrade or repair your iPhone. Our full-time skilled technicians are dedicated to giving you the most efficient iPhone repair available. iSolutions uses only premium and OEM replacement parts. We can offer you piece of mind that you have chosen the ideal source for your iPhone repair and service.